Rather like Superboy and other similar New 52-launched titles, the Supergirl series showed signs of going downhill even before we knew it would be cancelled with the next volume before Convergence. The book started with two relatively strong volumes, then had a volume almost entirely devoted to the "H'El" crossover that didn't acquit Supergirl Kara Zor-El well. Then the creative team changed for a troubled fourth volume, and now the creative team (and title direction) has changed again for Supergirl Vol. 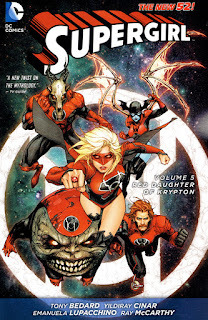 5: Red Daughter of Krypton, and then the team and direction is going to change one more time in the final volume. That many new teams, and that many new shifts, and you can sense trouble in the air. Red Daughter is actually an improvement over Supergirl Vol. 4: Out of the Past, though I have to give a lot of that credit to Red Lanterns writer Charles Soule and the Red and Green Lantern(s) issues and not to Tony Bedard's actual Supergirl issues. Red Daughter is a surprisingly good storyline/mini-crossover, better than what initially seemed another "Supergirl goes bad" tale, but again most credit for that goes to Soule's side. Red Daughter and Red Lanterns Vol. 5: Atrocities share some issues in common, but then also diverge slightly; if you only wanted to buy one of the two books, ultimately Atrocities has the more complete story even though both are necessary for the full Red Daughter experience. No doubt the needs of the "Red Daughter" story required some linking up on writer Tony Bedard's part (and it even seems Supergirl and the Lantern titles didn't match up month-by-month, something fixed in the trade). But what difficulties this Supergirl title has are evident in the first three issues, all of which involve nothing much more complicated than Supergirl and the new Lobo battling it out against a variety of different backgrounds. Again, what could probably have been a one-issue fight might have been stretched out to three for the purpose of keeping pace with the Lantern titles, but the result is issues without a lot going on. For a title trying to build up an audience, even an audience that knows a Red Lantern ring is around the corner and is willing to wait, this isn't a strong start. And whereas I do like Yildiray Cinar's artwork and thought he was a fine match for Legion of Super-Heroes, Cinar's more straightforward superheroic artwork doesn't suggest complexity here either, especially set against Alessandro Vitti on Red Lanterns. Vitti, too, manages to make Kara's rather overwrought Red Lantern costume look appreciably fearsome, including the domino mask, whereas Cinar and artist Emanuela Lupacchino have a harder time of it. To his credit, Bedard positions his Supergirl stories right in Supergirl's established world rather than starting anew (as Michael Alan Nelson did last time), and so the big Red Lantern switch emerges organically from the story being told. Dr. Shay Veritas is here again, a mentor figure akin to Lana Lang in Sterling Gates's Supergirl run; also my favorite, Supergirl's pal Siobhan "Silver Banshee" Smythe, makes an appearance (and I'd love to know what Bedard had planned for another favorite, the Triangle Title's demonic Blaze). The book's ultimate villain is a Worldkiller, from way back in the first volume of this series; in all of this, I appreciate that Bedard ties up loose ends rather than leaving new threads hanging. But the structure of Red Daughter is such that Kara fights Lobo for three issues, then Silver Banshee for an issue, and then we're into one Green Lantern and two Red Lantern issues (including the fantastic first New 52 meeting of Red Lantern Guy Gardner and Superman). Then there's a single issue of Supergirl that recaps the story so far (not included in Red Lanterns), an issue that's part two of a "Judgment Day" story whose first and third parts are collected only in Atrocities, and then the two part finale that's again mostly a fight between Supergirl and the Worldkiller. The meat of the book is largely in Red Lanterns, and whereas Bedard's second part to "Judgment Day" reads fine with the other parts in Atrocities, here it's just flat and confusing with no direction given as to where the audience should follow the cliffhanger. Happily, Bedard takes what could have been a "bad girl Supergirl" story and turns it into something ultimately redemptive that leaves the character in a better -- and less angsty -- place than he found her. But to get into a place where Kara becomes a Red Lantern, Bedard has to make her super-angry in the beginning at every bad thing that's ever happened to her ever, and that whininess is trying. Equally, in a few scant pages of the end, I don't think Bedard quite earns Supergirl's newfound love for Earth aside from that's where DC editorial needs Kara to be. Midway through the book Kara goes on at length about the Worldkillers and sure enough, with no dramatic irony, a Worldkiller appears in the end; at the same time, why this Worldkiller is a sentient suit of armor and the others were organic clones is never explained. And despite long-established lore that only a Blue Lantern can loose a Red Lantern ring, Bedard has Kara do it herself, which I thought was a bit of a cheat rather than finding a way to do it within the system (Indigo Lanterns, etc.). Supergirl Vol. 5: Red Daughter of Krypton gets a big boost from its crossover with Red Lanterns. If one really wants to know how Supergirl gets into and then out of Red Lantern form, this book is a necessary companion to Red Lanterns Vol. 5, but the best parts of the story are over there, and if you're only interested in the Red Lanterns, you can probably get away with just reading that one and not this one. Sounds like the Supergirl title was a rollercoaster in the New 52....I thought I heard that they are bringing her title back at some point so I really hope that whoever is on it does a great job, considering her show will be starting soon. Red Lanterns was so good. Did you ever do a review of that run?